[Image: Here we see phytoplankton illuminating the Denmark Strait, forming solar-mineral arabesques, glowing traces. 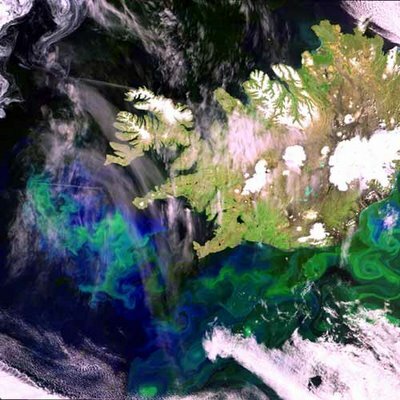 "While phytoplankton are tiny taken by themselves, together they can cause color shifts in ocean water, which in turn is detected by orbiting spacecraft." Next, you build triangular frames, squares and circles afloat on the ocean – then fill them all in with phytoplankton: a sea of shining geometry. Cubes of light cast adrift across the North Sea, photographed from below by divers. Courtesy European Space Agency].